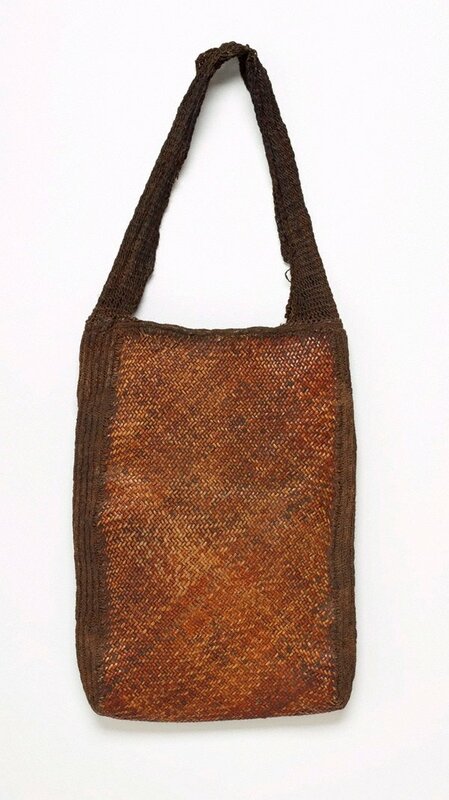 straps were sourced from old string bags obtained from female relatives. The netting required many hours of repair before it could be stitched to the woven sheet. A new 'aenkiya nuw' took up to 11 hours to complete, and decorations might include an edging of pigs' tails, or lengths of plaited chain links, known as 'pubung'. This 'aenkiya nuw', collected by Stan Moriarty in 1969, has an exquisitely delicate surface with subtle nuances of colour and tone throughout the weave.